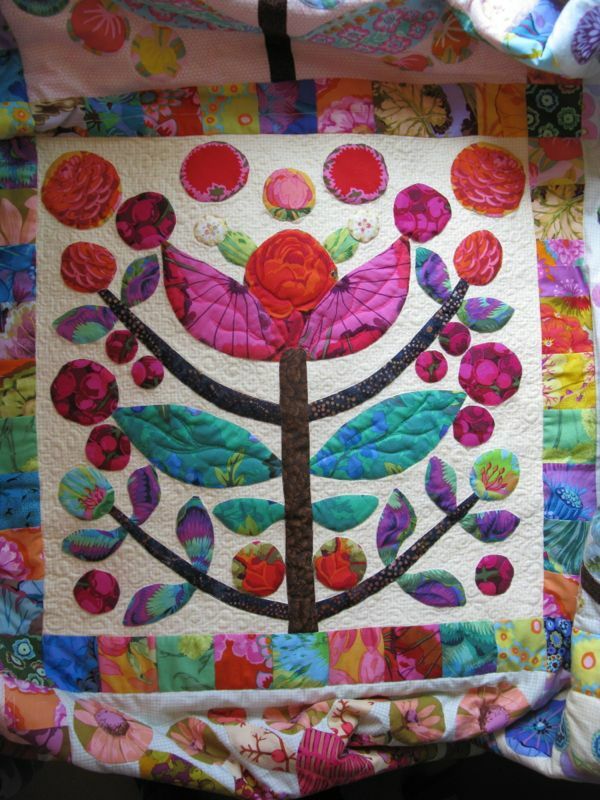 Posted on March 22, 2014 by Elizabeth E.
I started free-motion quilting my Lollypop Tree quilt. It has sat for nearly a year while I did Life and thought about how to start. I had quilted my Christmas Treat, but the spaces there were more wide open with fewer appliqués, so this one was a bit of a challenge, managing the quilt bulk and keeping the density of the stitches evenly spaced. I still have a few more details to take care of, like stitching around the trunk of the tree and across the leaves where they join the trunk, but after two-and-a-half hours, one block is done. 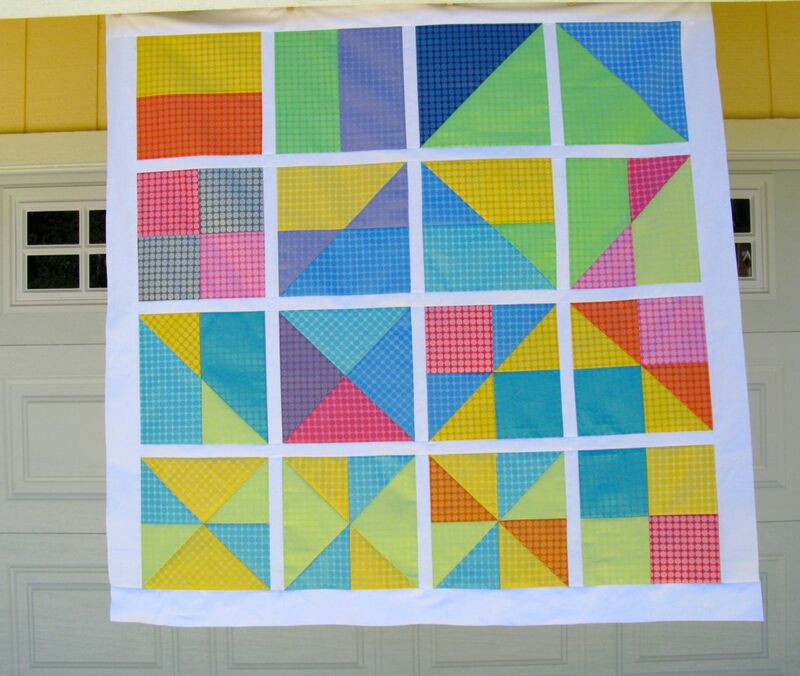 Look at the tab above if you want to see the entire quilt. Helpful sights: a Pinterest board with lots of filler ideas, Leah Day’s commentary on filler backgrounds, and multiple videos (not linked). I also put this as my home screen on my phone. It makes me smile. Hope you are smiling, too, as you enjoy your weekend. Posted on March 18, 2014 by Elizabeth E.
In class this semester, one of the types of poems that we studied were “form” poems, or poems that have a prescribed meter, rhyme scheme, and even construction, such as a ballad, a sonnet, or a villanelle. Many poets like to write poems in this constrained forms, especially if they are difficult subjects, as the nice, tight boundaries help keep the poet from going off the rails, sloppy and wandering. Likewise, every once in a while, it’s good to put one’s brain to a task with similar constraints, just to see if it can be done. 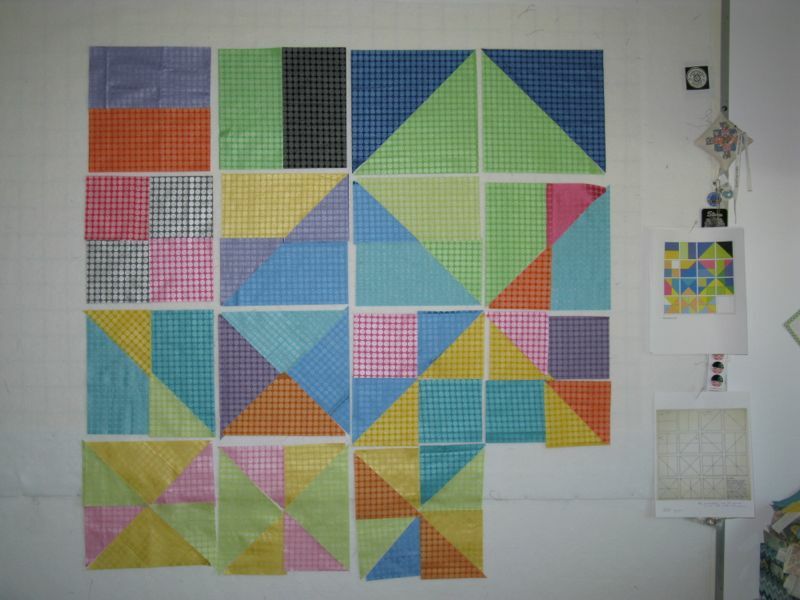 This quilt started with this drawing from Sol Lewitt: “Fifteen Etchings: Straight lines in four directions and all their possible combinations.” Lewitt is famous for his wall drawings, where he would draw up a certificate with a set of instructions or descriptions, and others would execute them. This drawing would serve as my shape boundaries. And my fabric boundaries? 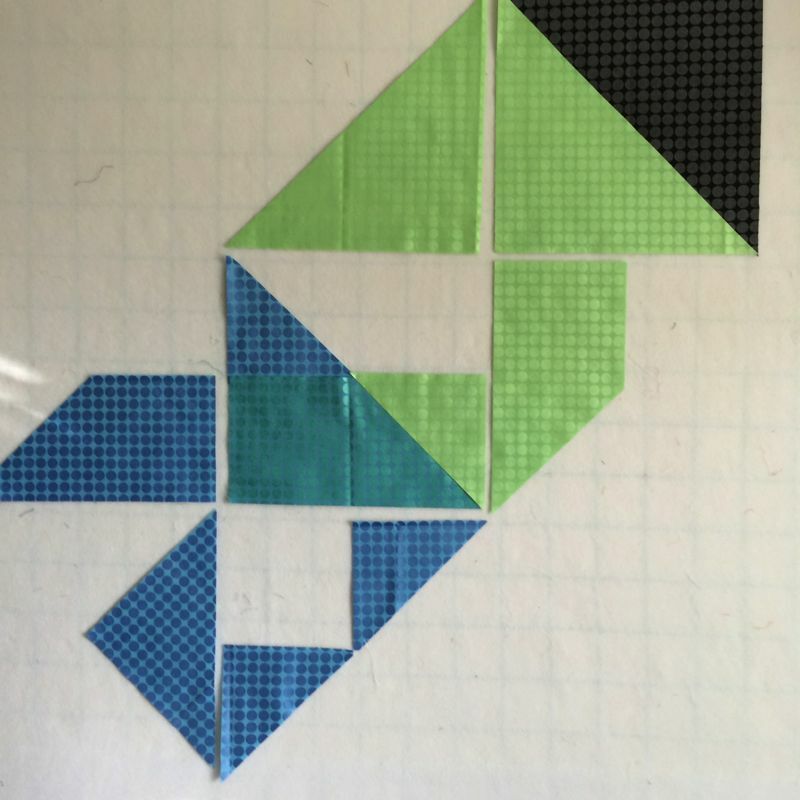 I had purchased a stack of Mirror Ball Dot fabrics two years ago to go with the few I already had, I decided to use these as my parameters for this quilt. 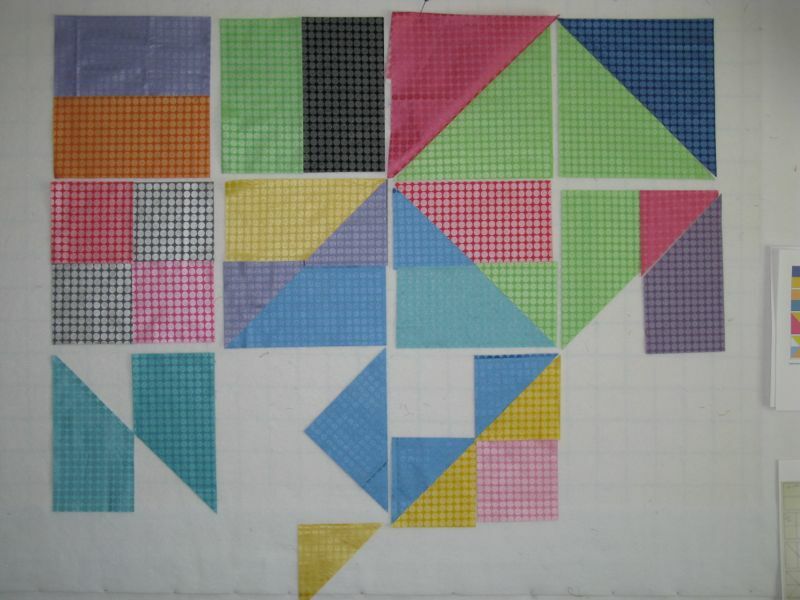 Those shapes, these fabrics, and I started cutting last Saturday, after grading seventeen essays in a 24-hour period (yes, the brain was fried). 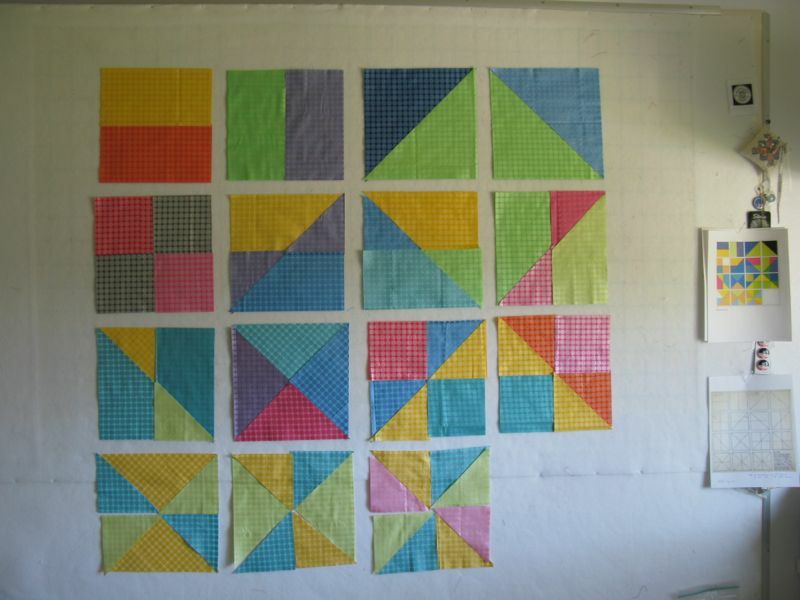 I started laying them out, beginning from the upper right. I cut, added. Rearranged. Went to bed. Cut, added, rearranged, asked my husband what he thought. Cut, added, rearranged, took a photo, then pondered. It was harder than writing a villanelle. All. . . Day. . .Long. 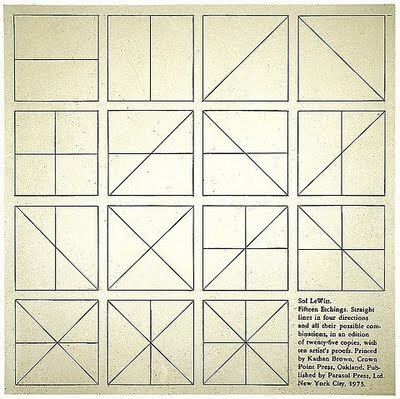 I was purposely leaving that last square on the lower right white, for that’s where Lewitt had the writing, the description. Just stop thinking, worrying, looking over your shoulder wondering, doubting, fearing, hurting, hoping for some easy way out, struggling, grasping, confusing, itching, scratching, mumbling, bumbling, grumbling, humbling, stumbling, numbling, rumbling, gambling, tumbling, scumbling, scrambling, hitching, hatching, moaning, groaning, honing, boning, hair-splitting, nit-picking, eyeball-poking, finger-pointing, alleyway-sneaking, long waiting, small stepping, evil-eyeing, back-scratching, searching, perching, besmirching, grinding, grinding, grinding away at yourself. Stop it and just DO! Do more. More nonsensical, more crazy, more machines, more breasts, penises, cunts, whatever – make them abound with nonsense. Try and tickle something inside you, your “weird humor.” You belong in the most secret part of you. Don’t worry about cool, make your own uncool. Make your own, your own world. If you fear, make it work for you – draw & paint your fear and anxiety. And stop worrying about big, deep things such as “to decide on a purpose and way of life, a consistent approach to even some impossible end or even an imagined end” You must practice being stupid, dumb, unthinking, empty. Then you will be able to DO! So the fresh question brought me here, where I think it will stay. 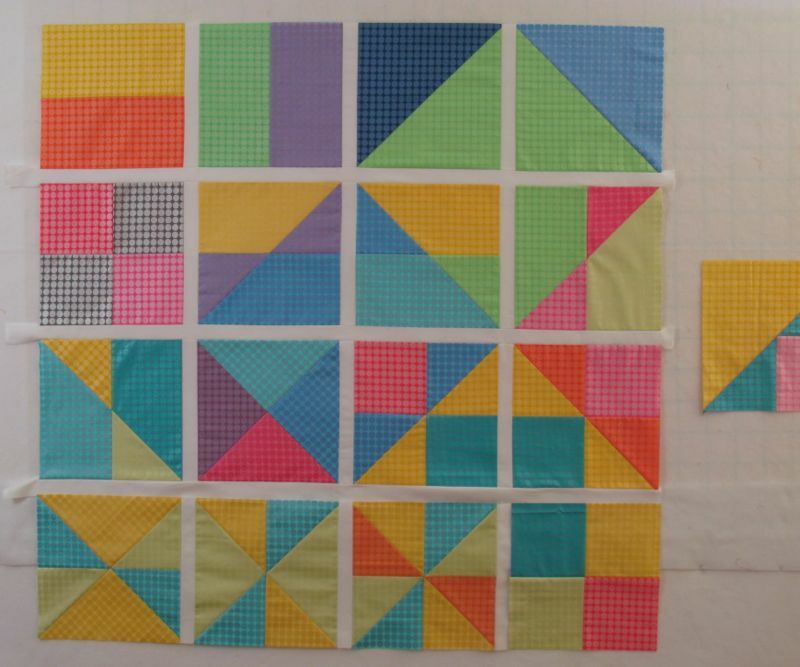 And yes, that block lurking on the right is an alternative block, which I am leaning away from. Borders (plain white) will be added last. A primer (prim-mer), according to the dictionary, can be as a child’s first book of reading, helping that child to decode and unlock the words on the page. 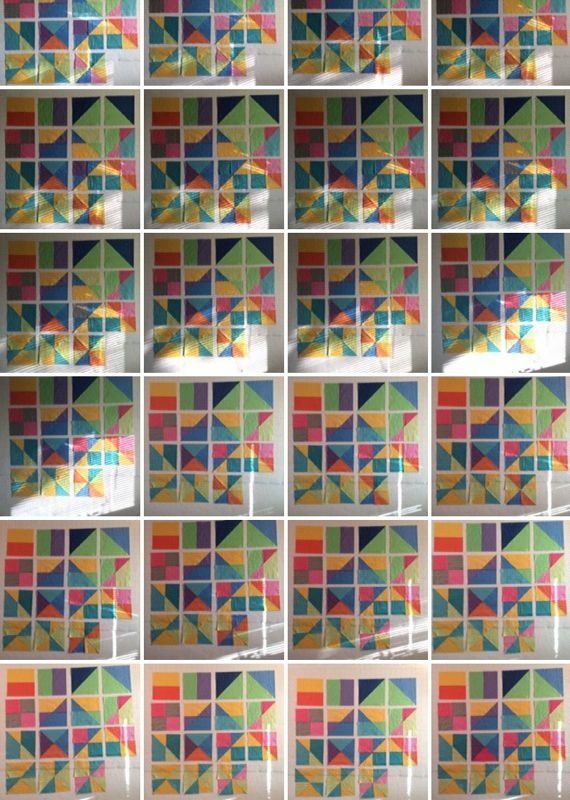 I doubt Sol Lewitt had any inkling of patchwork, steeped as he was in the fine art world, but when I saw his etchings, I recognized them as sort of a primer for what we quilters do: divide and subdivide and go at it again and again, always looking for that fresh question.